The muzzle device is designed to perform a specific task, like suppress flash intensity or reduce felt recoil. 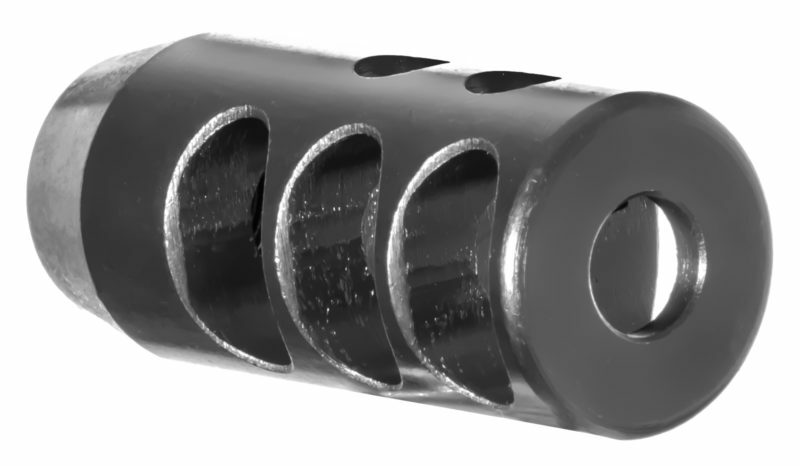 This compensator is machined from quality steel and finished with an exceptionally corrosion resistant salt bath nitride for a lifetime of service. It’s side and top ports provide a significant reduction in recoil flash. While its closed bottom with top and side ports offers reduced dust signature when shooting from the prone position. Our M018-2 Compensator will help you complete your rifle build with style. It is constructed from high strength steel with a nitride finish and 1/2×28 threads to fit on any, 5.56 NATO or .223 WYLDE barrel. It features ports on the top and sides to reduce recoil with no ports on the bottom to reduce the amount of dirt kick-up when shooting prone. This compensator is a great addition to your build whether you are building a 20” rifle or 14.5” carbine and is guaranteed to get the job done. I’ve used this style on both 5.56 and 300 blackout. A noticeable difference in the bird cage vs this style. For the price and it’s performance you can’t beat it.